Making paper airplanes doesn't feel like science. And it's not quite art. Near as we can figure, launching a regular old piece of paper into the sky so that it soars is pure magic. We present step-by-step instructions for folding aerobatic amazement's. 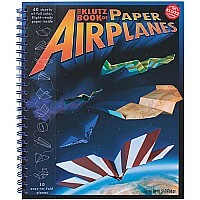 The ten airplanes in this book are the best we've ever seen. This big (10" x 12") book comes complete with 40 sheets of flight-tested, ready-to-fold paper, printed on both sides in a variety of 20 colorful patterns, including leopard print, wood grain, hot rod flames and lose-it-on-the-lawn grass. It's everything you need to rule the skies.